Sometimes in life opportunities just appear in front of you and the best thing you can do is jump up, shout yes, and make the most of it! That’s exactly what I did when the opportunity to visit Warr’s London with the legendary Charlie Stockwell for some bike workshop time appeared. I was pumped. It’s not something that normally crosses my pathway, so I was not going to let this opportunity pass by. The day before I was feeling pretty nervous, I was about to work alongside Charlie Stockwell! A two-time winner to Battle of the King, a legend in the custom world, a guy who KNOWs his bikes, his design, people literally look to him for inspiration on their own custom direction or get him to do it for them. What was he going to think of my Harley-Davidson, my home customs, my vinyl wrap restyle, my side mount number/licence plate I made one out of a stainless-steel pan, it was all running through my head. Compared to him, I’m literally just a little DIY home job, I learn from what I encounter…when I want to change something I learn off YouTube, I revert to the manual, when my bike needs new clutch plates, I learn how to change them, but it means there is so much I’m yet to discover. I decided the best approach was to channel my nerves into being as prepared as I could be! 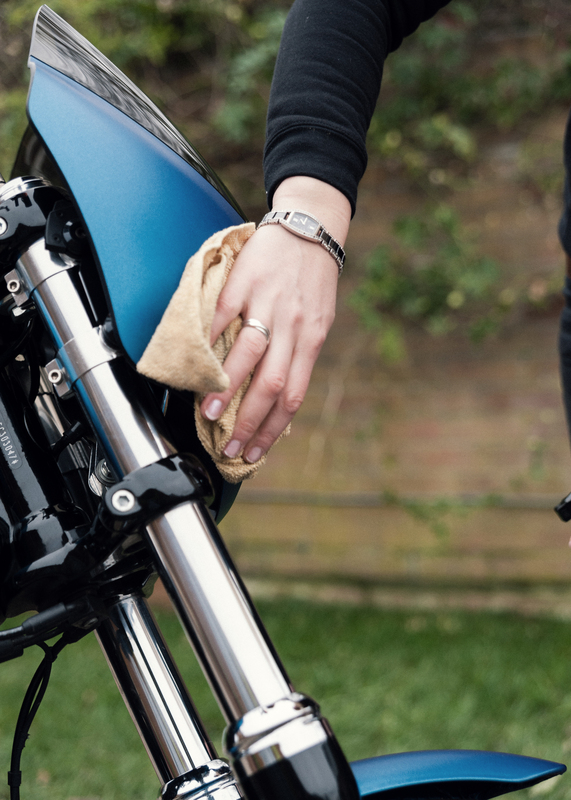 Hot soapy water in hand, I scrubbed, I wiped, I polished, and oh my I made Thug, my DYNA StreetBob, sparkle. We were ready! An early night and an early start. The alarm went, I was feeling pumped, shower time, make up, waterproof mascara [we don’t want any runs if my eyes water in the wind], breakfast shake, and I was hitting the road. It was a beautiful morning, one of those incredible spring days in England: crisp and chilly but glorious blue skies and sunshine. I had my Scarla Q3 rider headset playing my favourite country songs, with the odd sat nav direction popping through to make sure I didn’t get lost on my first visit to Warr’s London. I was buzzing. 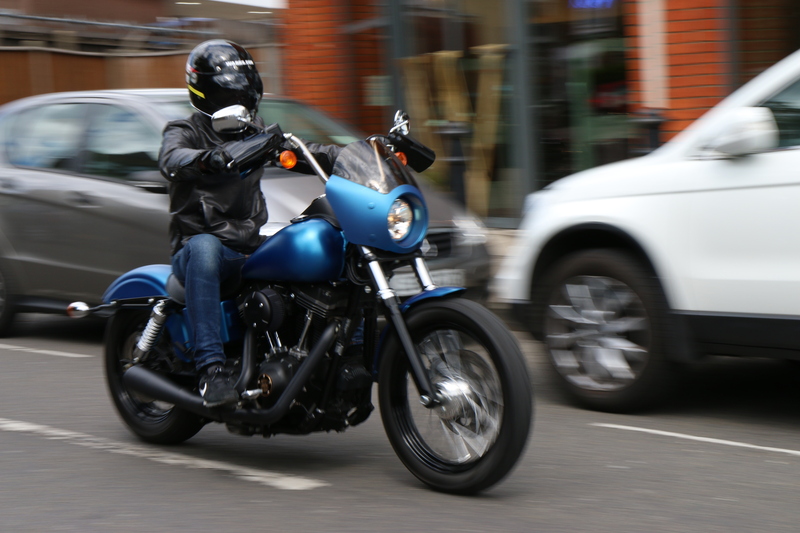 On arriving, I went straight round the back as directed and was rather overwhelmed to find a 40-odd strong group of bikers turning to see who was making all the noise riding in… oh my, was I in the right place? Thankfully Charlie spotted me and waved me over. I swiftly cut the engine and could feel the tuts from the group who were midst a pre-ride briefing. It turns out the local HOGS chapter were in-house pre-hitting the road! An entertaining start having a pack of HOGS glare me down! We had a good chuckle afterwards, so all was well. 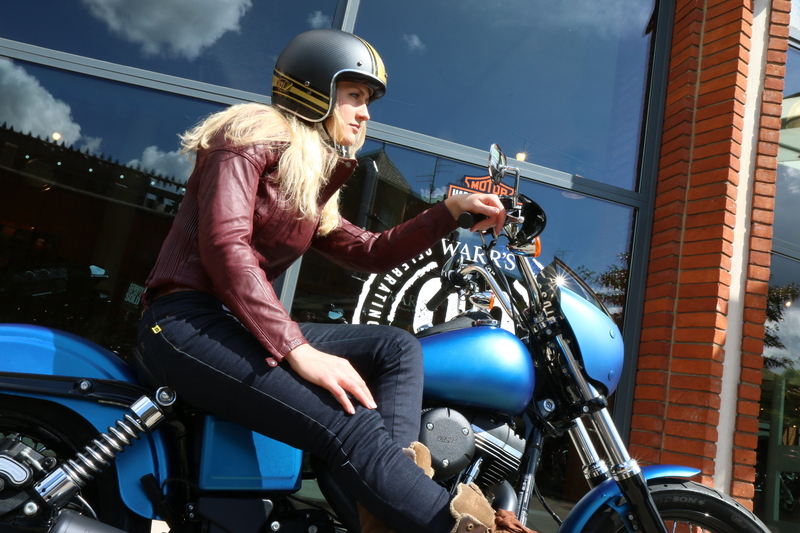 Charlie Stockwell, Head of Design & Custom at Warr’s London, swiftly introduced me to the team. We had Martin Szlagowski, General Manager for MAG Europe who was representing Vance and Hines for the new pipes, fuel pack and intake we were putting on, and Mark Bennett, the vlogger of MotoNewbieRider who was with us to capture the day. We then had a look around the fantastic facilities at Warr’s London and of course grabbed ourselves a hot coffee. We all know how good Harley-Davidson dealers make coffee. I couldn’t wait to get started. Charlie instantly got stuck in with T hug, spraying lubrication onto the bolts we needed to remove and popping a large fan on to cool her down, we don’t want any burns! She was then put on an impressive ‘Handy Air Lift’ – an epic piece of kit that’s basically an air compression controlled flatbed that holds the bike upright at the perfect working height – my 320kg bike was smoothly elevated as if a feather. Easy, and awesome. It was then time to look at the kit! Martin showed me the new 2-1 UpSweep pipes I’d chosen, and I was delighted to see that they were even more spectacular in person! Matt black, perfect curvatures out of the V-twin in two pipes before coming together in an aggressive merge to one. They were spectacular. We turned back around, and Charlie was already making progress, the old pipes were off, having lubricated it on our arrival, it was an easy removal. The thug was stood there looking rather naked without her pipes, but that wasn’t for long! It was incredible watching Charlie at work; he had all his tools lined up, he knew just what he was doing, it was smooth, seamless and just reaped confidence. I took a moment to absorb the moment, something we don’t do enough in our busy lives. 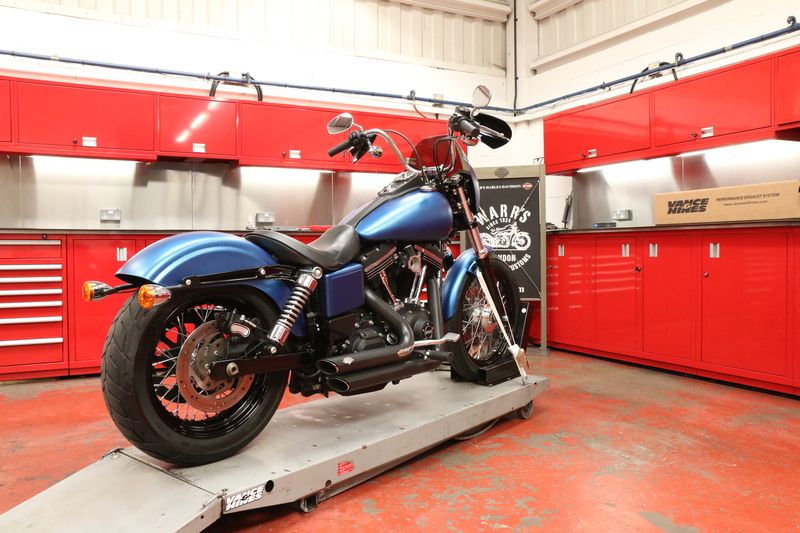 There I was, at Warr’s London, with Charlie Stockwell working on MY bike, with new Vance and Hines kit going on, stood alongside the MAG Europe team. There was a comforting smell of oil and petrol in the air, Mark was busy snapping shots and capturing the energy in the room, and I was there, at the moment. Having switched the pipes, it was time for Charlie to give Thug a once over before taking her for a test drive – I’m sure he secretly just wanted to take her out, double motive. At this point, he noticed that my throttle was sticking, something I’d just become accustomed too. I asked if he could show me how to tell and how to fine-tune the throttle and return cables for optimum throttle performance. I wanted to be able to know myself next time and also hold the knowledge to correct it. Charlie was fantastic; he was so warm and receptive to me wanting to learn and understand exactly what he was adjusting. After all, I won’t always have a legend about to help me! So, adjusting the cables, you ultimately want a 100% throttle opening and swift shut back, it was simple, but there were little tricks he showed me on gauging the sweet spot, having the bars to the right, listening for the ‘click’, all so helpful to take away. I jumped at the moment and told him about a slight vibration was I feeling on cornering. I had already diagnosed that it wasn’t the wheel bearings, there were not tire flat spots, the wheels were balanced and running true, and the bars were tight…I was out of ideas. Thankfully Charlie was all over it! He said he’s felt it out on the test ride and see what we could do. That meant it was time! Time to hear the new sound! Just to set the scene, when I first discovered my love for the DNYA StreetBob it had the Vance and Hines short shocks. The purr, the burble, the popping. It was the sounds that really caught my heart. It was like an arrow straight in. There was no escaping it, and so I got the same short shocks on my StreetBob. So why was I changing? Because apparently the 2-1 UpSweep sound even better! How is that possible? But I can tell you now, in that next moment I heard first-hand the truth. It can get better! The 2-1 UpSweep have an incredible tone. They’re louder in some ways but quitter in others. I almost want to go as far as to say their less obnoxious. More balanced. 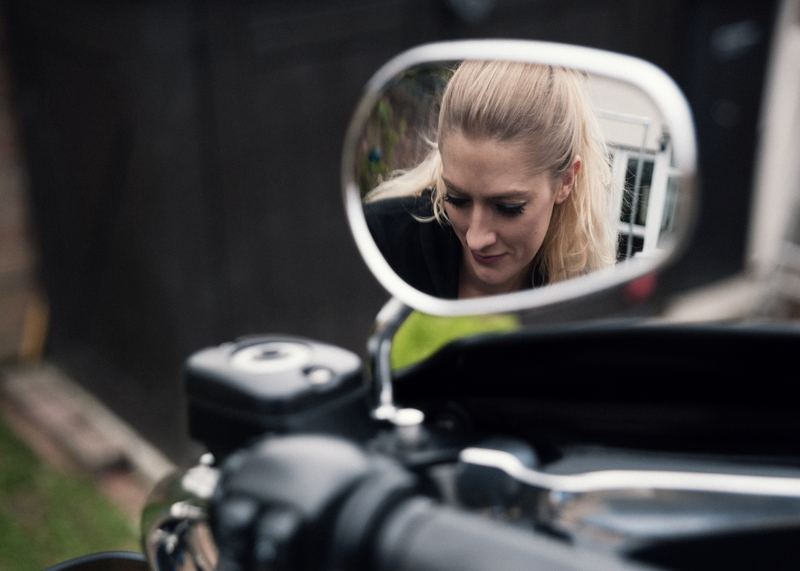 You get the grunt, the deceleration popping, the purr, the deep pull of raw V-twin power. Tuned to precision. I was instantly ecstatic. 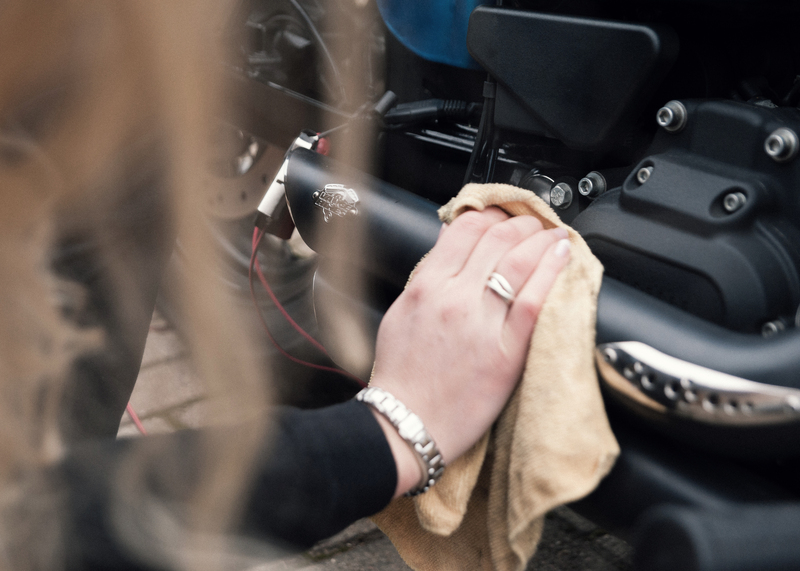 When you think the perfect sound can’t get more perfect, you need Vance and Hines UpSweeps in your life. 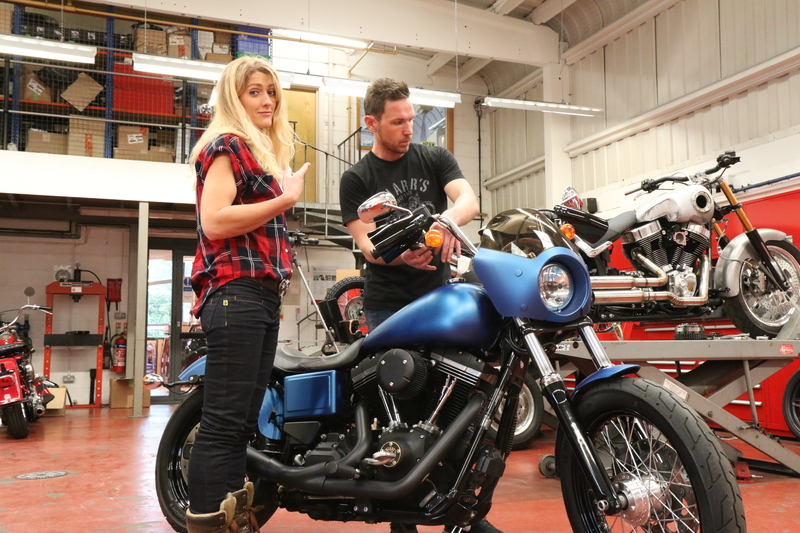 It was at this point that Martin, from Vance and Hines, introduced the app! Yes, an app that can tune the performance, sound, track statistics and generally do awesome stuff. As soon as he said you could adjust the amount of deceleration pop I was sold! I love that: the power in the palm of your hand with the FP3 Fuel Pak. We got the Thug tuned up, with a little extra pop [of course], and she was ready for a test run. Charlie was off, and I have to say, I might be biased, but yeah he looked good on Thug. The bellowing raw as he disappeared out of sight. And we, of course, heard him returning before we caught sight of him too! I was chuffed to see a big smile on his face. Charlie was pleased with the install, all was running smoothly, and he even had an idea of what the vibration could be! Another learning session for me is coming. It turns out you can over tighten bars…so much to learn, and it’s not something you get a torque gauge for…which isn’t too helpful but there is a knack to it, and I was about to be shown. Nice! It’s all about how freely the front wheel falls to the left or right when jacked up. You want the bars to fall on their own but not too keenly. You also want to make sure there’s no clicking play when lifting the base of the forks. It’s tough to explain, but Charlie managed to make it all make sense. I’m pretty sure I could do it myself next time. Vibration. What vibration! Fixed by a legend! We had great fun shooting in the sun, Thug looked incredible with her new kit, and I was literally buzzing! Top takes from the day? The pub over the road from Warr’s does a killer Sunday roast! A day with a legend complete, and I really look forward to seeing the team again in the future.